Although this blog was created to be a repository of the best places to eat in Ankara, it’s sometimes necessary to chronicle the restaurants that fail to impress as well. 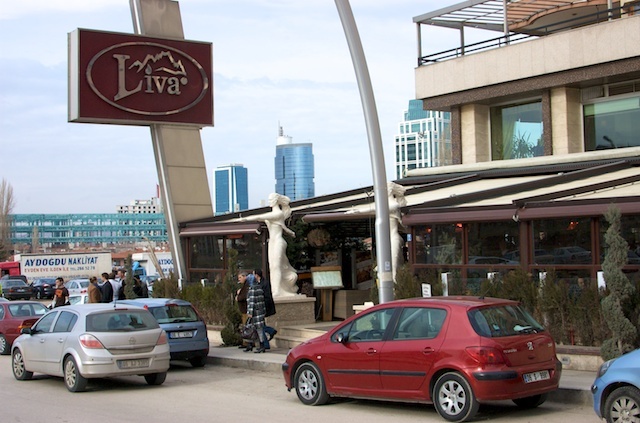 One such establishment is Café des Cafés in Kavaklidere. 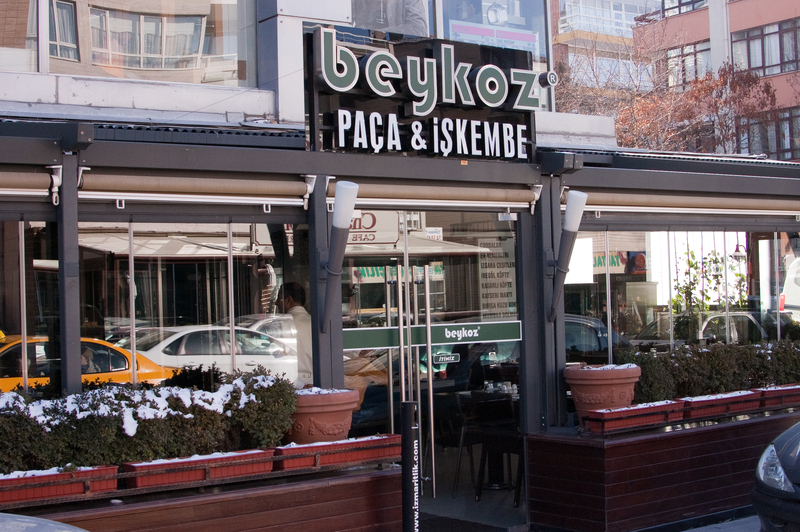 This chic, French-inspired eatery was recommended to me by several people, including the Ankara section of Lonely Planet. Despite such positive reviews, I can say without reservation that my lunch at Café des Cafés was the most disappointing of my time in this city. At first glance, Café des Cafés looks promising based on appearances alone. The decor and ambience are charming and a welcome change from the sterile, uninspired design prevalent in most Ankara restaurants. It’s the sort of place one might envision on some side street in Paris. The menu also looks appealing. I have previously written about an expat’s need for respite from Turkish food, and Café des Cafés appears to provide such relief. It offers a sizable variety of bistro fare, ranging from sandwiches to salads to pastas. But the accolades stop at the food. My friend and I sampled a varied selection of items for our lunch today to test the diversity of the menu. We ordered the Greek salad to start. Despite allegiances to my current country-of-residence, I will admit that Greeks make a superior salad. So naturally I was quite disappointed to see Café des Cafés slaughter such a tasty dish. An overabundance of lettuce, soggy olives and a poor excuse for feta cheese left the salad largely tasteless. Still, I tried to keep my hopes up for the rest of the meal despite the early misstep. Per the advice of my friend Jim, better known as Eski Kanka on the football blog The Round Ball in Ankara, I ordered the sosis steak sandviç. I must have misunderstood his recommendation because it was, simply put, the most disgusting thing I’ve eaten in Turkey. A sloppy mess of ketchup, melted cheese and Turkish hot dogs (you know exactly what mean by “Turkish” if you’ve ever eaten one), I couldn’t bring myself to finish the sandwich. It might be the only time in recent memory that I wasn’t able to clean my plate at a restaurant. Indeed, I made more progress on the brain salad last week. My dining companion did only slightly better with the margherita bruschetta. When ordering bruschetta in a typical Italian restaurant, one expects to receive something reminiscent of small toasted bread slices topped with seasoned diced tomatoes. What we got today, however, would be more at home in the frozen food section of an American gas station than anywhere in Italy. The “bruschetta” (I’ll use quotation marks to signify a blatant misnomer) was actually cheesy bread with a diluted tomato paste sauce. It’s the sort of snack I would microwave during the wee hours of the morning in college, not what I expected to see at a café in one of the trendiest areas of Ankara. Whenever I have such a decidedly horrendous dining experience at a otherwise decent-looking place, I tend to give the restaurant the benefit of the doubt and suggest that I ordered the wrong things. I don’t think I can do that with Café des Cafés. I left today with the feeling that it is the type of place that specializes in duping wealthy Turks with faux-European food. But take this review for what it’s worth, especially since I am writing this with the vitriol inspired by a terrible meal still pumping through my veins. 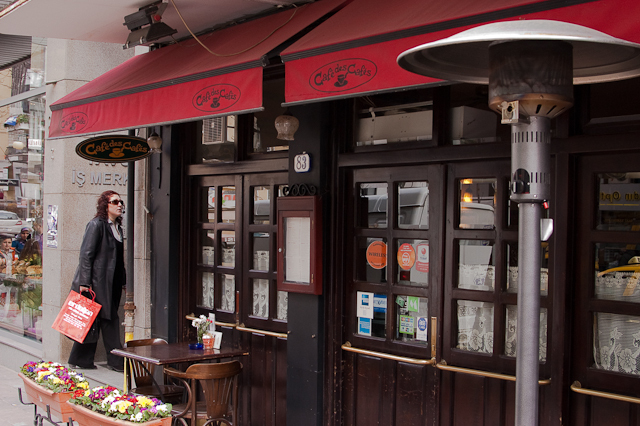 Café des Cafés is located on the popular Tunalı Hilmi Cad. in Kavaklidere (Google Maps). Prices are upmarket: Lunch for two people followed by coffee costed 55TL ($36 at 1.52TL/$). Human beings eat with a variety of considerations in mind. At times we seek pleasure or enjoyment. In others we require only basic satiation. But there are also instances when curiosity or a desire for adventure motivate our eating. It is this latter inclination that might best describe my recent lunch at Beykoz Paça & İşkembe. Per the recommendation of Deniz over at Yemek Lazım, I ventured to Çankaya early this afternoon to sample some of Beykoz’s famous işkembe çorbası (tripe soup). It’s reputed to rank among the best in the city. I’ve always been a fan of intestine; the unique texture and flavoring make for a tasty combination when prepared properly. But I’ll admit it’s not for everyone. This soup, in particular, doesn’t exactly offer the best aromatic experience. So if you’re daring enough to try işkembe çorbası, do so with an open mind. I’ll be the first to admit that it’s not my favorite option in this country. While eating intestine is as repulsive as it gets for most people, I decided to up the ante today. Beykoz also offers an old Ottoman creation, beyin salatası (brain salad). Yes, I typed that correctly: brain salad. Do I have particular affinity for the taste of a lamb’s central nervous system, you might ask? No, not at all, but it’s always a good culinary philosophy to be willing to try everything at least once. And that’s just what I did. There’s no way to avoid saying this: beyin salatası was a decidedly bad eating experience. I’m usually hesitant to be so negative about any food, but it’s really all I can say here. By itself the poached brain is disgusting: flavorless and with texture reminiscent of extra dense tofu. Together with lettuce, parsley, olives and tomatoes, dressed with vinegar and fresh-squeezed lemon juice, it’s edible, but far from delicious. I’m honestly not sure of the appeal in eating it. Sure, there’s some novelty involved, and at least one website cites special nutritional value. But there are so many better salad options in Turkish cuisine that it’s reasonable suggest this is one part of the lamb that should be allowed to go to waste. If I’ve piqued your curiosity, you should make the trip to Hoşdere Cad. (Google Maps) to give both a try. Each item costs around 7TL ($4.50 at 1.53TL/$). For those who don’t care to be so adventurous, Beykoz also offers vast selection of other Ottoman-inspired dishes to please your more conventional palate.